Thank you to Lucy from Midas PR for getting Book - Love - Bug involved in this blog tour. Meredith Hathaway has spent the last seventeen years pretending to forget. Until she gets a letter and her world is shattered in an instant. She must finally confront the rise and fall of the Hathaway dynasty... and her own part in their devastating history. 1946 Iowa. One woman is determined to change her fate. With unwavering ambition Lavinia Hathaway will stop at nothing to ensure that her family succeeds at all costs. Now Lavinia’s legacy, Aurelia, the once magnificent family home, lies empty, a husk of its former self, a gaping wound of the Hathaways. Unable to resist the lure of buried secrets and bitter memories, Meredith must now face the truth or be destroyed by it. The door is open... dare she walk into the past? When I first got my hands on this book, I knew it was going to be something special. The cover has a luxurious feel; soft and full of depth. I wasn’t disappointed. “I WAS CALLING FOR HER. I pointed the flashlight into the darkness, punctuating the purple haze of the evening with circles of white. The air was full of the smell of azaleas and the sound of crickets, and I began to think of how much I would miss my home. For a moment, I was truly scared of leaving the farm, and I was stricken with both the fear of the unknown, and my desire for it. I gave up a shudder. The sharp snap of twigs being twisted into the earth. I swung around and moved off the path, down to the rose garden. I heard them before I saw them. His voice was low, half in a whisper, but in the stillness of the night, it carried. And then another noise. At first, I didn’t even know it was her. It was a sound I had never heard from her before. Chapter 1 is an opening chapter from Meredith, set in the present day, which lays the foundations for the whole backstory. Meredith narrates. The rest of the book is divided into sections focusing on other main family members; (Meredith’s grandmother, Lavinia, Meredith’s aunt, Julia and Meredith’s sister, Ava). Meredith continues to narrate, and these sections of the book flit from the past to the present as the story unravels. This book is like a mass of tangled ropes; you only need one of those ropes, but you have to ease yourself around the others and slowly unravel and untangle them until everything becomes clear. This creates a gripping book, which I found incredibly difficult to put down. For me, the storyline didn’t lag at any point and it held my interest from the first sentence to the last. 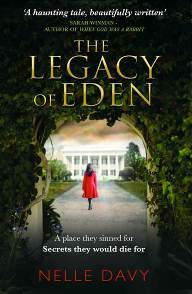 Nelle Davy creates a complex cast in The Legacy of Eden, and at times I felt like there should be a family tree lurking at the front of the book to avoid any possible confusion. The narrator sometimes refers to, for example, “her uncle” whereas other times she will refer to them by name; to start with I found myself pausing to think and confirm “now which one is she talking about?” However, it didn’t take long for the family tree to be engrained in my memory, as Nelle Davy creates deep and remarkable characters. I think it should be noted though that if you find it difficult to remember characters and their links to each other, you may get a little lost and confused at times – but don’t let that put you off, if anything, just create your only family tree as you go along! The setting to the story is Aurelia, the family home and the family business. The place itself takes on a life of its own; it’s like a supernatural force that will ultimately destroy everything. The detail that Nelle Davy incorporates is exceptional and conjures up some wonderful imagery for the reader. I did think that the final “Hathaway secret” to be exposed would be more dramatic than it was, but having taken time to consider it, this isn’t disappointing. The final secret to come out is the one which is alluded to in the prologue, and there are plenty of shocking antics in between that first page and the last. The final secret is simply the final nail in the coffin, which finally tips the balance; I don’t think the author ever intended it to be incredibly unpredictable and a shock to the reader (there are a few hints along the way). This book isn’t necessarily about making amends, it’s about the Hathaway family and their history, not about their future. Nelle Davy has a very powerful and rich writing style, which is seriously impressive for a 27 year old. The Legacy of Eden is an incredible debut from an extremely talented young author; Nelle Davy is one to watch! Book - Love - Bug: What inspired you to become a writer and where did the inspiration for The Legacy of Eden come from? Nelle Davy: I escaped in stories. I found books to be life rafts when I was a child that I could use to sail away from my home life but I couldn’t always afford books and once, exasperated, my mother told me to write a story myself in order to stop me asking her, so I did. And I didn’t ever stop. Years later on a train ride to University mid term, I was reading I, Claudius and I thought it was such an amazing story about a diseased and ultimately corrupt dynasty that out of supposedly good intentions brought down their own family and all its glory. I kept wondering what it would be like to transpose it to a modern setting and this great estate came into my mind… a beautiful farmland that they would live on and love and die for but which would destroy them. I couldn’t stop thinking about it and I sort of played around with it a bit for a couple of years and then finally when I left University and got a job and felt ready, I began writing it. And just like when I was a child, I didn’t stop. Book - Love - Bug: Having read The Legacy of Eden, I was surprised to discover you were born in the UK - what made you set this book in Iowa and did it take a lot of research to come up with the detail? Nelle Davy: It had to be somewhere which had a real connection with the land and somewhere, where a place like Aurelia could exist – which naturally, with its history and scope, was America. I never felt that while writing, I should feel constricted by my nationality and background. If an actress can play any part from any century, why shouldn’t a writer feel the same way? That is why it’s fiction. But it did require a lot of research, predominantly to ensure that while I may not have been American, the book was not an English person’s idea of America, but indistinguishable from American novels. That was my ultimate goal. Book - Love - Bug: Where did the title The Legacy of Eden come from and how does it fit with the story? Nelle Davy: It wasn’t the original title. And sadly I did not come up with it, my amazing editor did at the time. They didn’t like my title and I didn’t like their brainstorms and it all got a bit too much like a stalemate. She emailed me in the middle of the night and suggested this and I thought at first, I didn’t hate it and I could understand it’s link to the story. The notion of something aspirational like paradise and how these people fought to create it, got really close, but ultimately failed and what it was like living with that history. It was a title that grew on me over time. Book - Love - Bug: Can you tell us a little bit about your next book? Nelle Davy: It is set in Louisiana during the civil rights movement in 1963 and the heightened tensions of race relations. It is so different. My first novel in terms of scope is so small but this is so vast and much more historically weighted. Book - Love - Bug: Are you a big reader yourself? What are you reading at the moment? Nelle Davy: Huge! I have 15 books on my bedside table waiting to be read and I love to re-read novels too. Right now I have Marilynne Robinson’s Housekeeping in my bag. She is a beautiful writer.